It was evident to me, about twenty pages into the reading of ‘Rain’ (Readomania, 2016), that Sriram Subramanian is someone who should write. Odd choice of word, perhaps, for clearly he is someone who does write, evidenced by the fact that this is a review of his second book. But I use should advisedly. For there are a lot of people who can write, and many, many more who do write, but not many who should. When I realised that this is a writer who can express thoughts in a clear, concise, logical and structured way without dumbing-down or indulging in jargon, I felt it was a fair call. 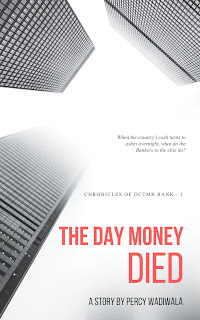 In his first novel, which I have reviewed here, Sriram brings these skills to bear upon a philosophical story about a Pune-based architect and his personal battle with faith and the world. 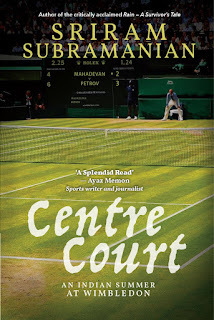 In a sense, his second offering, Centre Court (Readomania, 2017), could not be more different. It is a ‘Sports Fiction’ novel, set in the near-future where a young-ish Indian player, Shankar Mahadevan makes a glorious run at Wimbledon. The novel beginss with him at the end of his tether after dealing with injury, a hostile press and the monumentally corrupt – and slow – Indian tennis establishment. 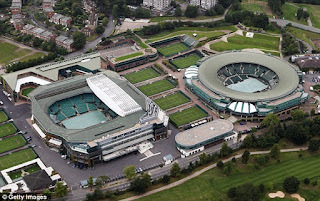 He arrives at Wimbledon having made up his mind that this will be his last attempt to make an impression on the larger tennis world, a decision his father, who accompanies him like a sort-of manager, has difficulty coming to terms with. Along with his coach Milind they settle in for the campaign and we are treated to a story that goes both forward and backward into the genesis of Shankar’s career, his love for the game, his journey so far and of course, the tournament as it unfolds. The other POV, that of Shankar's father, makes for equally interesting reading. Since I'd rather avoid spoilers, I shall content myself by saying that there are insights into tennis, sport in general and the philosophical underpinnings that link it to life, as he ruminates and expands upon what it takes for a 'tennis parent' to bring their child to the highest level. Like the ebb and flow of a tennis match, or even, one might say, a Grand Slam campaign, the story’s pace ratchets up and down, from the highs of Shankar’s match victories to the lows of his personal struggles. His relationship with a former girlfriend is explored, as is a casual liaison and a flirtation with a reporter, all of which provide insight into the character and the nomadic life of the professional sportsperson. As he faces opponents from around the world and of varying levels of ability and playing styles, we get to see the sporting archetypes that should be familiar – the jock, the jaded veteran, the earnest upstart and the reluctant prodigy. These are all very real and very much a part of the real milieu that makes sport such a fine approximation of life. For Centre Court is a thoroughly realistic novel. The ‘fiction’ part of ‘Sports Fiction’ should in no way be taken to mean that this is a literary version of Salman Khan’s Sultan. Every incident, every word, is thoroughly believable, every scene and setting meticulously accurate. As someone who has seen Wimbledon, from highlights to documentaries, with obsessive interest, I can vouch for Sriram’s replicating the experience of being a player with real felicity. Every character is well-drawn here, with motivations and personalities, flaws and merits. As the threads of Shankar’s personal life and his professional achievements begin to weave together, we, along with him have to face the questions that are not confined to just the players of sports – when do we settle? What is a compromise? When can we call it a happy ending? The plot of Centre Court, as I said before, has the pace and excitement of a tennis tournament. For those who have played it, or any other sport, it is likely they will find a lot of places where they would smile as a memory, pleasant or unpleasant, would be recalled. For those who are not as much into sport, the book does a good job of making it relatable without getting too technical, and Pa (Shankar’s father) and his reflections bring life and meaning to many a sporting anecdote from real history. In terms of intent and achievement, there is little to cavil at. Sriram sets out to write a riveting novel about sports and make a commentary on life’s vagaries along the way, and does so admirably. As a character study of Shankar, it works just as well. The incisive thrusts on herd mentality and the rot infesting sports administration on India are only too real; their predictability a sad reflection on how much we have accepted and internalised incompetence. Which brings me back to the point I made originally. In a world where there are no apparent consequences to rank mediocrity, where the ability to think, let alone think as clearly and articulate well is at a premium, we need more Centre Courts. But even as a bright, fun read, I would say it is quite the perfect little book to tide you over the gap between Wimbledon and the US Open, and maybe even help us dream a little of the day we will see an Indian make a splash on Centre Court. Prologue - Pride and Shame, a Dragon Age Fanfic.